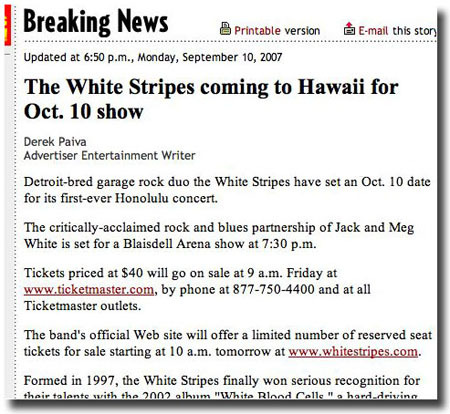 Okay, Tuesday I was all ready to have tickets bought for the White Stripes concert in Honolulu October 10th but the ticket sales mysteriously disappeared. Today’s Honolulu Advertiser has the answer to the mystery which I kinda already knew from a friend I was going to concert with. They are supposed to bump the concert to a later date and I’ll be making a trip to Honolulu for sure and I’ll have to get my backstage pass too. Their latest album Icky Thump rocks, one of the best albums of the year. I hate to be the bearer of bad news, dude – but I heard on KROQ this very morning (Wednesday, Sept. 12) that the White Stripes are canceling their fall tour. Seems Meg is suffering from "acute exhaustiion." Sorry, man. Yup, I heard about the health thing Tuesday morning but was hoping something might change by then since they still had their other concert dates listed. Nah, she can crash at my place, as long as she leaves the drum kit at home and the drumsticks…ouch! This is a WordPress comment via iPhoney, not quite an iPhone but unless someone wants to buy me one this is all I have to test with. Next PostNext Where is the world is Steve Fossett?